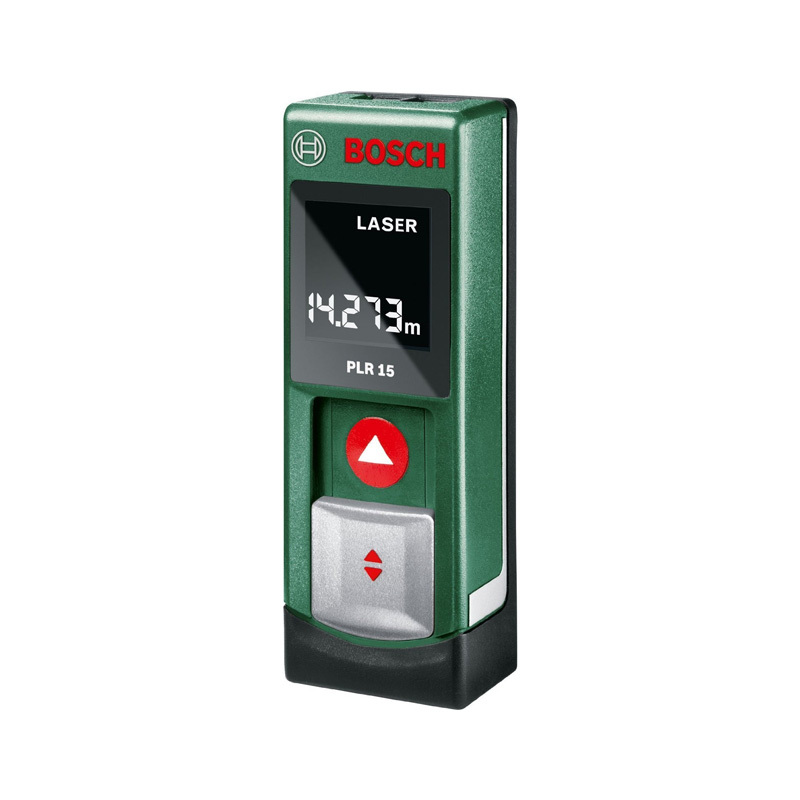 The Bosch PLR 15 Laser Rangefinder technology provides high levels of precision every time for quickly measuring lengths and distances. Whether you’re measuring just to hang pictures the same distance apart or to see if a new piece of furniture will fit in your living room, just switch it on and off you go. The design of the Bosch PLR 15 keeps it simple to avoid a need for specialist knowledge, and instead can be used to take a measurement at the use of just one switch. 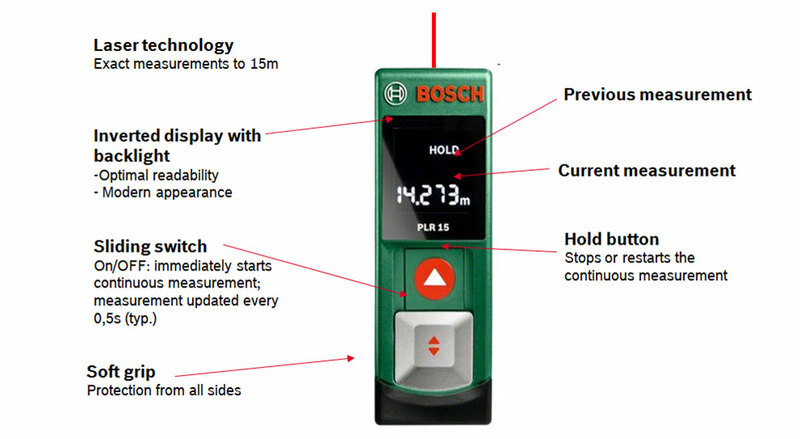 The Bosch PLR 15 gives a continuous measurement which can be stopped with one press of the red button and then restarted again with another press. This simple design makes it even ideal for individuals who are new to laser measuring technology. 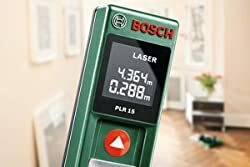 The Bosch PLR 15 offers accuracy of +/- 3 millimetres up to ranges of 15 metres regardless of the distance being measured, as the laser is beamed in a direct line towards the intended target. In comparison, rangefinders using ultrasonic technology can only offer accuracy of +/- 50 millimetres over a distance of 10 metres as the waves emitted spread wide and can hit multiple objects which all deflect and therefore can provide false results. 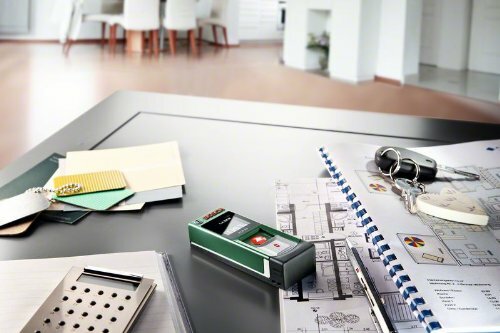 With dimensions of just 100 x 36 x 23 millimetres, the Bosch PLR 15 Laser Rangefinder is a small laser rangefinder, fitting comfortably in your hand and easily into your pocket. The Bosch PLR 15 is also quicker to use than a tape measure as well as more accurate and capable of greater distances. The sliding switch feature makes it a quick and simple to use tool so even those with less experience in DIY can use the PLR 15 with ease. The soft grip provides protection to make it a more robust design which gives the PLR 15 a longer lifespan, and also makes it comfortable for the user to handle. The LED screen has a backlight to illuminate the display screen and make the results easy to read, as well as give the tool a modern attractive appearance. After using the hold measurement function and having restarted the continuous measurement function, the LED screen displays the previous measurement that you measured and stopped on as well as the current measurement now being taken. 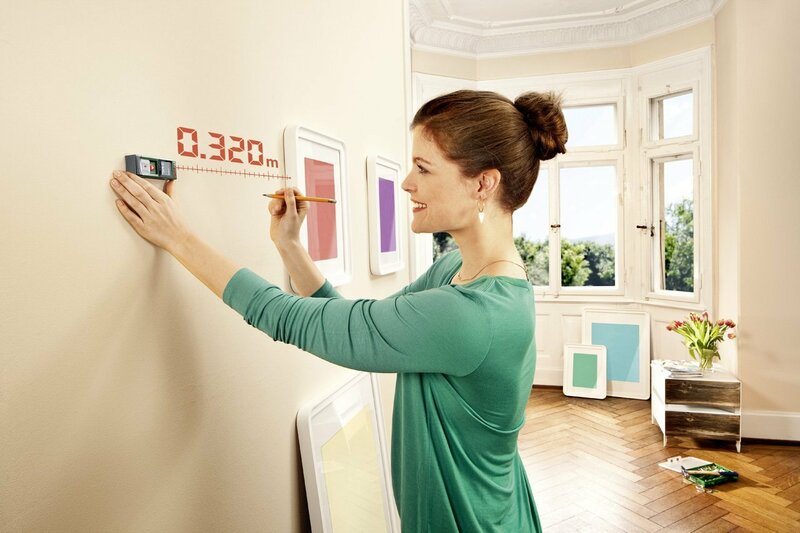 Digital measuring tools from Bosch impress with precision and extremely easy operation–whether when levelling objects, measuring distances or detecting all different kinds of materials and power cables.